Urban & Industrial sounds hard and edgy but it’s actually sophisticated and charming. 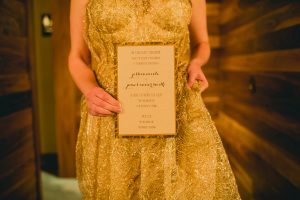 These stylish Urban Industrial Inspired Wedding Invitations were created by Hyegraph Invitations & Calligraphy for a styled shoot which was published in “Blissful 2 Be” Magazine titled The Modern Urban Shoot in their “Love Is In The Air” February 2015 issue. 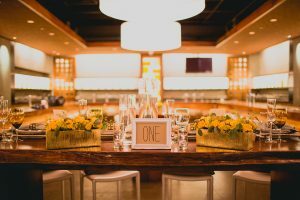 The fabulous Wedding Planner was Carolyn Wilson of Carolyn Wilson Weddings & Events. 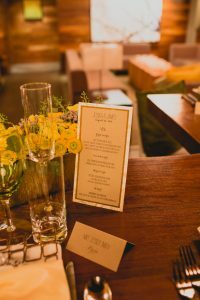 The chic photos were shot by Carleigh Fager of Sweet Poppy Studios at the Press Club, San Francisco, California. 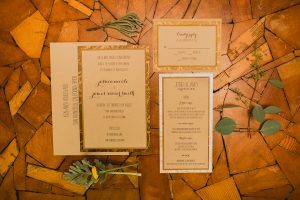 The above exotic invites are created using earth tones from our Envelopments Line. We were able to accomplish the Urban Industrial effect using Kraft paper and marbles with bronze tones papers. 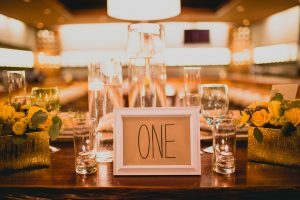 We love designing with Envelopments because it allows us to be creative and come up with unique looks to match the wedding or party theme. The ink color for the printing on stationery and envelopes was Mocha. The fonts used was Script-Carolyna Pro Black and Block-Stange Love all printed by Hyegraph Digital Calligraphy. We worked closely with the talented Carolyn Wilson to come up with the Urban Industrial Wedding Invitation, with matching invitation stationery including the wedding invitation envelopes, the wedding invitation respond/reply card, wedding menu card, wedding favor tags and wedding envelope addressing. 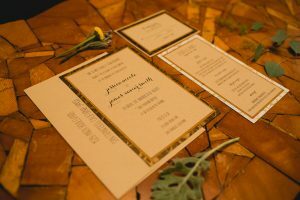 You can see all the stationery examples above which were shot by the talented Carleigh Fager of Sweet Poppy Studios at the beautiful Press Club in San Francisco, California. 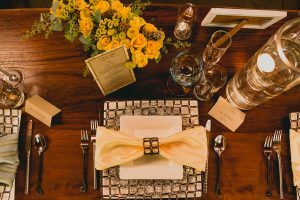 All the Invitation Stationery above was created using our Envelopments Papers in three layers except for the favor tags & place cards. The bottom layer is Custom Marble Shimmer ~ The middle layer is Bronze Plumes ~ the top layer is created using Kraft Paper. The Custom Invitations measure 6″ W x 9″ H and cost $6.50/each. 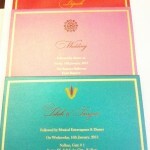 The Custom Invitation Response/Reply Card measures 5.5″ W x 4″ H and costs $4.50 each. The matching menu card measures 4.5 ” W x 8.5″ H and costs $6.50 each. 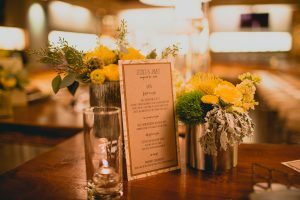 The table card measures 7″ W x 5″ H and costs $4.50. The adorable Kraft “Thank You” Favor Tag measures 3.5″ W x 2.5″ H and costs $2.50/each. 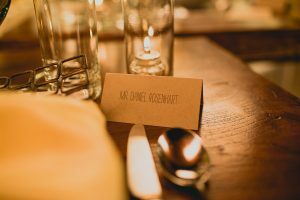 The Kraft Paper Place Card costs $1.50 each. All the prices include printing by Jacques using Hyegraph Digital Calligraphy. 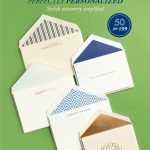 The Kraft Envelopes cost $1.50/ each including the Digital Calligraphy Printing. Please Call, Come in or Email Us for custom quotes or make and Appointment for a FREE WEDDING CONSULTATION. We are more than happy to work with you on your next special project. Here are all the talented individuals who were involved with the styled shoot published in “Blissful 2 Be Magazine”. 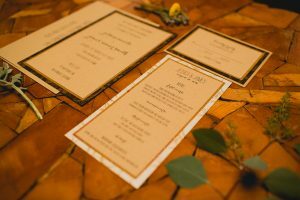 Thank You to Carolyn Wilson, Sweet Poppy Studios, Press Club San Francisco and all the talented professionals who created this beautiful Styled Shoot that Hyegraph was asked to part of the stationery design process.